Cooking meat in a slow cooker for long periods leads to a distinct progression of textures, where longer is not necessarily better. Now that we have a household immersion circulator, we wanted to examine how long bath times impacted meat. Does sous vide produce an similar uneven trend of tastiness (yum -> blech -> Mmmm… -> “can I have some water”) that the crock pot does? Whole chuck tender prior to steakification. 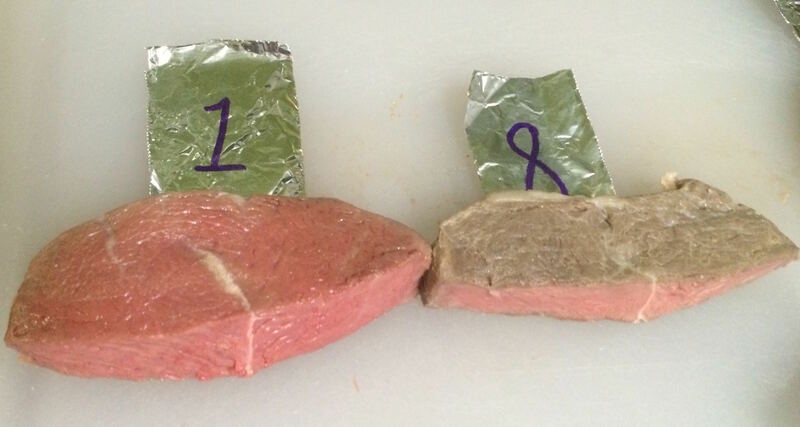 Chuck tender steaks, labeled and read to take a bath. 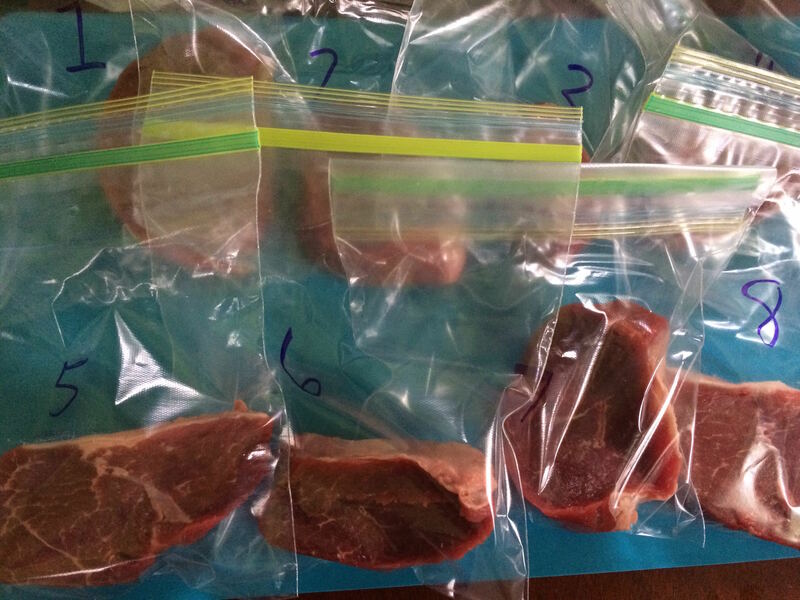 Starting with the bag labeled “8”, add 1 steak to the sous vide vessel after each hour. Chuck tender steaks post hot-tubbing. Numbers indicate how many hours they were in the bath. Steaks are un-salted, and un-seared. Unlike the crock-pot test, there were no “meat deserts”. However, there is a visible change on the exterior from pink to grey, and the interior color seems to lighten with cook time. Cut 1 hr and 8 hr steaks. Note the change in surface color and the lightening of interior color. 1-hour: tender, juicy, and excellent with salt. 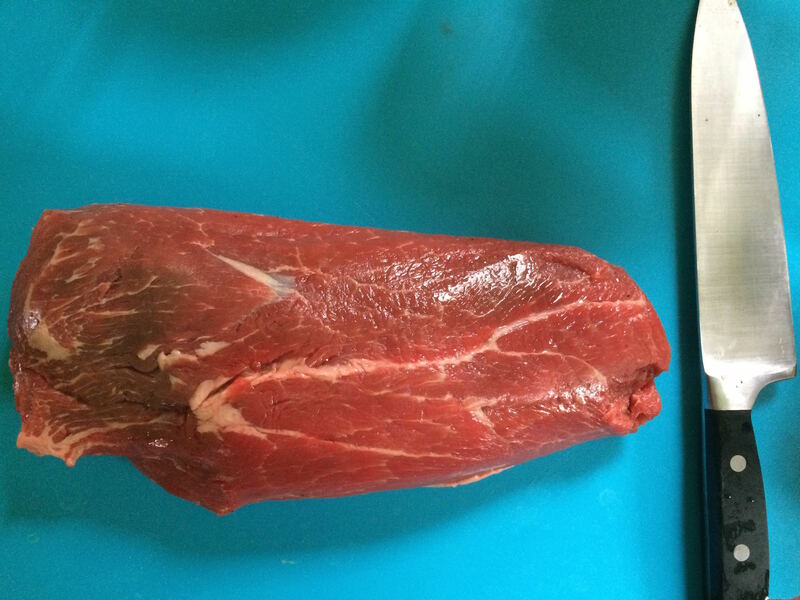 This is the most visibly attractive steak, with a nice pink color. (NOTE: we typically start our steaks this way, 1 hour in the water bath, but then followed by a quick sear). 5-hour: may be the start of some odd (liver-like?) flavors. 8-hour: seems chewier, lacks flavor; tastes “wet” (watery). Salt helps but it is still a bit unpleasant. Steaks 1 and 8 were “meat neighbors” within the muscle, so the variability noticed is due to cook time, not intra-meat variability. While the steaks were held at 130°F, which is considered at the border of rare and medium rare, it is above the temperature of myosin contraction. According to McGee’s book (On Food and Cooking: The Science and Lore of the Kitchen ), myosin begins to contract and squeeze out moisture around 120°F. Steaks served at this temperature (rare) would be firm due to the myosin contraction, but juicy. However, in typical steak preparation, the steak hits 120°F and then is brought back down quickly. In a sous vide scenario, it is held above that temperature for long periods. While never reaching the temps that cause abundant releases of fluids (140-150°F) or conversion of collagen (160-170°F), prolonged holding seems to result in degradation of quality. 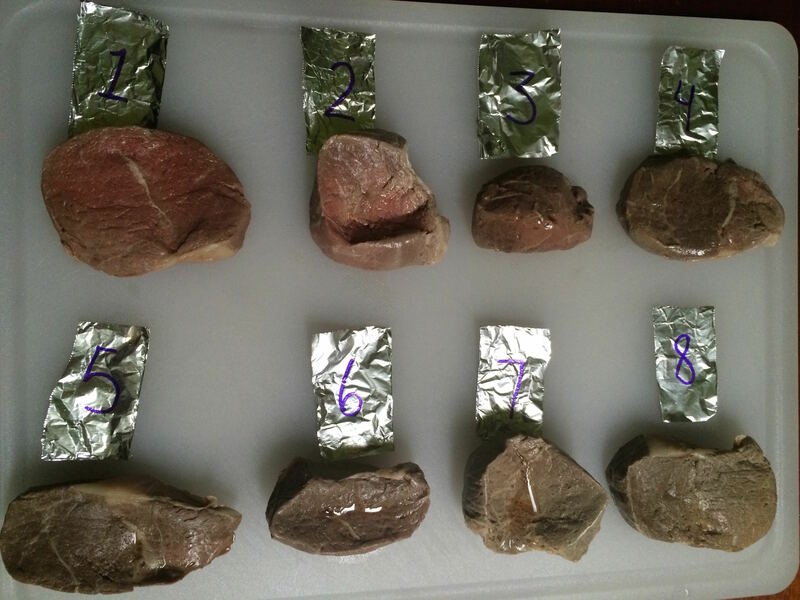 None of the steaks were quite as terrible as the worst meat chunks from the similar crock-pot experiment. However, the loss of flavor with cooking seemed somewhat surprising. It is thought that perhaps the fluids released during cooking might leach materials from the steaks and that oxidation from using ziptop bags rather than a proper vacuum-sealed pouch, might be culprits. While protected from the cooking water, the steaks are essentially poaching in their own (in this case, unseasoned) fluids, and boiled meat is typically not considered a pinnacle of meat preparation techniques. What if the meat is held at a temperature below that of myosin contraction? Would vacuum sealing change the flavor or color results? Bogue, Robert H. (1923). Conditions Affecting the Hydrolysis of Collagen to Gelatin. Ind. Eng. Chem., 15 (11), pp 1154–1159.